There has never been a better time to receive high current income through professionally underwritten trust deed investments. Private short-term loans on well-positioned real estate with substantial protective equity can offer high yields and compelling investment returns with a low correlation to stocks and bonds. Trust deed investing is an attractive alternative for individuals and institutions seeking to augment or replace traditional asset classes and income sources. Private mortgage borrowers generally pay a higher interest rate than they would at a bank, which in turn provides trust deed investors with higher yields than bank deposits. Bridge Loan Financial originates carefully underwritten loans backed by institutional quality real estate. Our extensive real estate investment experience and attention to detail ensure we underwrite first-position trust deeds with the strongest protective equity. Bridge Loan Financial offers mortgage investments directly to individual and institutional investors, and through fee-only financial advisors. Financial advisors, attorneys, and CPAs seeking secured income solutions for their clients should consider the alternative investment solutions offered by Bridge Loan Financial. Individual investors seeking stable cash flow or an investment that may offer more predictable returns than volatile stock and bond markets, may want to consider an opportunity with Bridge Loan Financial. Secured real estate lending may make sense for retirees seeking to increase their regular income distributions as well as long-term investors looking to balance the riskier parts of their portfolio with an income stream generated by trust deed investments with the potential to yield 8% or higher. Our loan programs are available directly to individual investors and trustees. Commitments of capital help us fund new loans, providing attractive opportunities not available through traditional retail sales channels or investment products. Our interests are aligned with those of our investors. In fact, we view our investors as partners and have processes in place to share profits in cases where the sale of collateral is required. Real estate and other alternative asset classes comprise a significant portion of many institutional portfolios. The investment objective of Bridge Loan Financial is to deliver above average risk-adjusted returns with a low correlation to other asset classes through the security of exceptional levels of protective equity. The dislocation in the credit markets has created an extraordinary opportunity to provide much needed equity to a growing number of individuals and businesses through private debt financing. 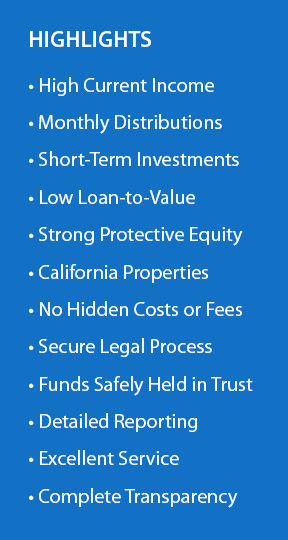 Bridge Loan Financial stands ready to provide well-collateralized loan programs on properties in California and neighboring states and research new loan opportunities that best meet the specific needs of institutional investors. Bridge Loan Financial seeks partnerships with fee-only financial advisors considering alternative investment solutions for their clients. At a time of heightened stock market volatility and a bond market exposed to historic interest rate risk, financial advisors are challenged to find stable income sources that can provide diversification to a portfolio of traditional asset classes. Well-positioned real estate with a high level of protective equity can offer above-average income with a low correlation to stocks and bonds. Proper portfolio structure requires a comprehensive understanding of each investor’s risk tolerance, investment objectives, tax position, income and liquidity needs. Financial advisors with this understanding are best suited to make recommendations that will best serve their clients.